College Coach? Click here to view all of Casey's information. Hi, my name is Casey Austgen. I have been playing tennis since I was 6 years old. I train every day, and play USTA tournaments throughout Florida almost every weekend throughout the entire calendar year. I played number 2 on varsity for my first two years in highschool, and now play number 1. My school is ranked second in the state for our division. I am 5'11" and weigh 155 pounds. The strongest parts of my game are my footwork, speed, groundstrokes, and mental toughness. Although I consider myself a strong singles player, I generally play doubles in every tournament I enter. I consider doubles play another asset I can add to a college program. High school tennis allows me frequent match play, I was undefeated last year until the state finals, at the number two position. During this year, I am undefeated at the number one position. I would like to go to a state school, or any good school, with a strong tennis program. I am very open minded about the college I will attend, and am willing to go almost anywhere with a solid academic program. I would like to major in sports medicine, because sports are very important to me, and I am interested in athletics. Both my parents are involved in health care. I would like to play as a freshmen, but I am willing to sit on the bench for my first year as i prepare to play later on. I have been extremely fortunate to be trained by many great coaches. Currently, Rodney Harmon is my current coach regarding USTA training and tournaments. His email is rharmon@deerwoodclub.com. He has been the American Olympic team coach, and a great college coach. Previous tour play and ATP tournament director, Weller Evans is my current high school coach. Coach Evans' email is mevans1880@aol.com. 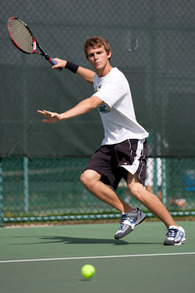 I am used to working hard on my tennis game, and can be a great asset to any collegiate team.